The Creyke Porch was donated by Elizabeth Rose Rebecca Creyke in memory of her second husband Alfred Richard Creyke, 1831-1892. He arrived at Lyttelton on the ship "Canterbury" 21 October 1851 from London. His father was the Ven. Stephen Creyke, Archdeacon of York. Memorial inscription for Alfred Richard Creyke in the porch of Christ Church Cathedral. The Harper Memorial is not the only one of which hopes are held out to us. A very recent mail from England brought news to the Cathedral Chapter that Mrs A. R. Creyke proposes to erect the western porch as a memorial to her late husband. This, besides being a handsome addition to the building, will enlarge the accommodation at the western end, and will probably give much-needed additional warmth during the winter season. 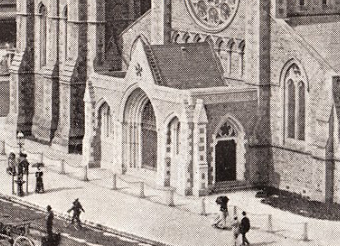 If we have no alternative but to defer till more prosperous times the prospect of the completion of the cathedral, we may at least regard with thankfulness these hoped-for improvements, the gateway and porch, with the iron fence, as worthy instalments, and bright auguries of yet better things to come. A Porch For The Cathedral. Preparations were begun yesterday for the erection of a Marthex, or western porch, at the main entrance to the Cathedral. The porch is the generous gift of Mrs A. R. Creyke, and is in memory of her late husband. The porch will be 30ft long inside by 15ft wide. Fronting Colombo street will be a large arch with a gable, which will contain the main entrance doors. There will be a circular window over the head of the arch, and on each side of the main doorway will be a two-light window in a recessed bay. There will also be a door in the north and south end walls, with a circular window over the head of each. The walls will he 17ft high, and will be carried out in blue stone, with facings of white Oamaru and Mount Somers stone. The walls will be finished with an ornamental parapet, and throughout there will be a large amount of fine moulding work. The present entrance doors, and the temporary porch inside the Cathedral will be removed, so as to afford a clear entrance from the porch. The floor of the porch will be tiled with Maw and Co.'s incised tiles, with cement inlays. The work will, as far as possible, be in keeping with the character of the main building, and will be very ornamental. It will add greatly to the appearance of the Cathedral, and will increase to some extent the accommodation. The architect is Mr B. W. Mountfort, and the contractor for the work is Mr W. Stocks. Maw & Co. Ltd provided the flooring tiles for the Creyke Porch. WILL OF AN OLD CANTERBURY SETTLER. 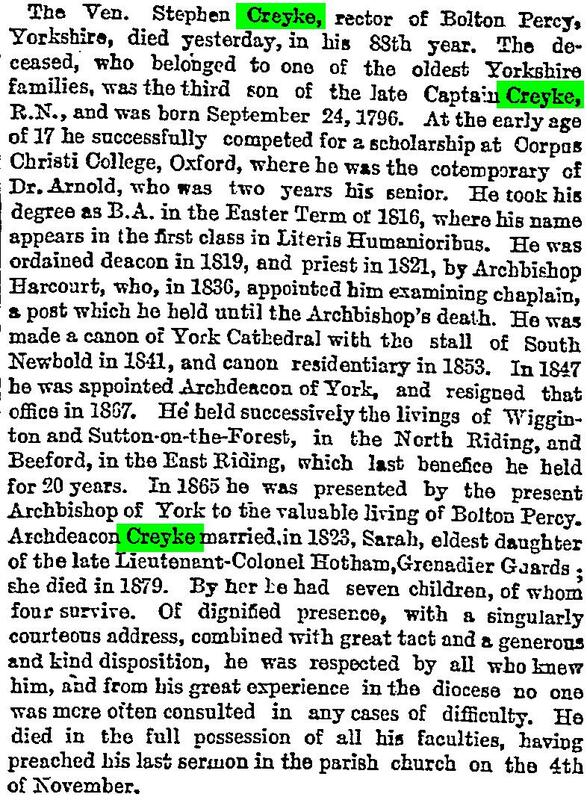 The will dated October 31st, 1892, of Mr Alfred Richard Creyke, late of Holbrook, near Horsham, Sussex, and of 112 Eaton square, who died on November 30th, was proved on December 30th by Colonel Sir William Assbeton Bardley-Wilmot, Bart, John Berkbeck Lubbock and Richard Dawes, the executors, the value of the personal estate amounting to upwards of £180,000. The testator gives the Holbrook estate, 112 Eaton square, and all his furniture, plate, pictures, books, household effects, horses, carriages, and live and dead stock to his wife, Mrs Elizabeth Rose Rebecca Creyke, and there are other gifts to her. He bequeaths £500 each to the Church Extension Association, Kilburn Park road, and St. Stephen's Orphanage, York; £500 each to Richard Patrick Clogstoun, John Charles Watts, Bertie Lubbock and his niece, Barbara Bagge; £200 each to his executors, and to each servant in his service at his death; £5 for each complete year of service. The residue of his real and personal estate, except his property in New Zealand, he leaves upon trust, for his wife for life; at her death he further bequeaths £6000 each to five daughters of his sister Caroline Julia Bagge; £12,000 to Stephen Salusbury Bagge, son of his said sister; £2000 to Sir Robert Grenville, Bart; £7000 to Captain Charles Batenon Harvey; £7000 to his niece Thyra Creyke; £6000 to his niece Freda Creyke; £12,000 to his nephew' Rolf Creyke; £24,000 in equal sharps to the four daughters of his brother Walter Pennington Creyke; £12,000 to Launcelot Creyke, the son of his said brother and the ultimate residue to his wife absolutely. By a separate will (dated July 22nd, 1889) the testator gives all his real and personal estate in New Zealand to his wife absolutely"
Mr Creyke arrived in Christchurch in the very early days and was occupied with pastoral pursuits. He subsequently sold out and became the owner of a considerable amount of town and suburban property. He lived for a number of years at Ilam and went Home early in the sixties. I see it announced among the notices of recent wills proved that "Mrs Elizabeth Rose Creyke, of Holbrook, Horsham, Sussex, and of 112 Eaton square, London, has left estate of £76,694, of which she has bequeathed £200 each to her cook, her maid, her butler and her coachman.". Mrs Creyke was the widow of Mr Creyke, formerly of Islam (sic), Christchurch, New Zealand, who died many years ago. Mrs Creyke also gave one of the Cathedral's window's in memory of her first husband John Charles Watts-Russell and £100 towards the Harper Memorial, about a sixth of is cost.